Reuters reports on a big test project the Transportation Department is putting on in Ann Arbor, Mich. Over the next year, DOT and the University of Michigan will fit nearly 3,000 cars, trucks and buses with wireless devices that track other vehicles' speed and location, alert drivers to congestion or change a traffic light to green, if conditions are safe. The cars, which come from eight companies including GM and Toyota, will be able to communicate with roadside devices at 29 locations around town. Oh, we have so many questions about this, including: where are the devices? What happens when drunken college students figure out they can change traffic signals? And how are we going to tell if one of these cars is ahead of us so we can honk at the driver to get the light to turn green? All kidding aside, Transportation Secretary Ray LaHood says this is a "big deal" and could actually cut down on the number of crashes. He thinks car-to-car communication is the way of the future. As long as drunken college students don't game the system, that is. After the transfer, the Journal-Sentinel says the state and city will be able to start spending $10 million from the federal Troubled Asset Relief Program, or TARP, on the cleanup. It's fascinating that more than two years after Chrysler emerged from bankruptcy, there is still work being done to clear out its old plants. Of course, we know about the task that the Racer Trust faces in finding buyers for leftover GM plants (it just found a real estate developer to take on a parcel in Mansfield, Ohio). 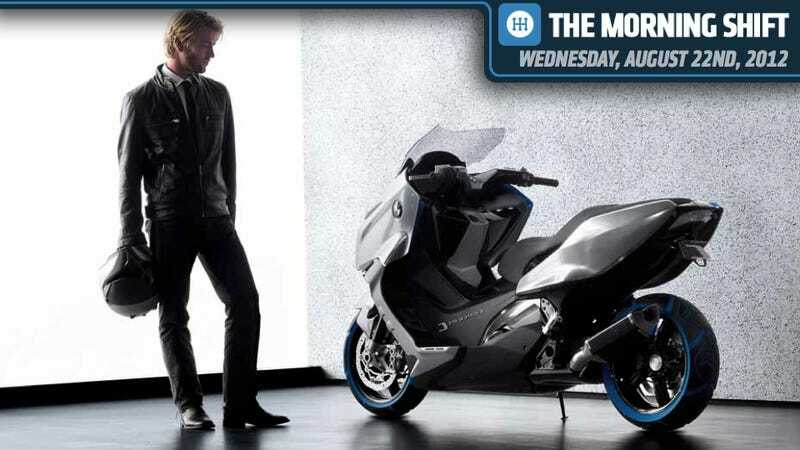 Bloomberg tells us that BMW is getting back into the scooter business. It hasn't sold one for nine years, since it discontinued the C1. But Audi's purchase of Ducati has revived BMW's interest in the market. These are not docile little put-puts that can be driven around town, though, but well-powered two-wheelers. "The new scooters offer us a massive sales opportunity," Heiner Faust, sales chief for BMW motorcycles, told Bloomberg. The idea is to attract what the company calls "sleepers" — car owners who rode motorbikes in their youth. "The maxi scooters are the ideal products to activate them," Faust said. BMW plans to deliver at least 10,000 scooters next year — equivalent to about 9 percent of the company's motorcycle sales in 2011. GM CEO Dan Akerson is bent on breaking through GM's stodgy corporate culture. But Lawrence Hrebiniak, professor emeritus at the Wharton School, thinks yet another GM reorganization might end up doing more harm than good. Hrebiniak is particularly concerned that creating global function heads, which Akerson argues are more efficient, will just take GM back to the days when its operations were in silos. "Efficient? Perhaps; with centralized purchasing and the scale and scope, economies are possible," he notes. "But more effective? Centralization is usually associated with less nimble and slower responses to diverse global markets and customer needs. Centralized controls also demand better coordination and information-sharing - tasks that if not done well can increase inefficiency and slow [down] responses to geographically dispersed markets." Instead of just move the pieces around, Hrebiniak thinks GM might be better off rethinking the way it evaluates its performance. "Provide incentives for desired and clearly stated performance goals; hold people responsible and accountable for performance outcomes; change or move people who don't perform; and promote managers who meet the revised performance parameters and who value cooperation and knowledge sharing for the common good." Without doing so, in the future GM "will be looking [back] at the ineffectiveness of yet another structural change and wonder what happened," he says. Now, I know some folks think any criticism of GM is just more media bashing. But this isn't a reporter, it's a management professor who knows his stuff. Let's talk about DOT's smart car project in Ann Arbor. We've driven in Europe where state-run systems will override the radio to give you the latest traffic reports and instructions for how to avoid bottlenecks (particularly amusing in German). Do you want your car to get this kind of info? Or do you have doubts that it can work? Do you have any experience with this technology? Remember there's no right answer or wrong answer. It's Neutral.